Whether you are already a Texas Master Naturalist, a new training graduate, or someone who is interested in joining our chapter, you may have a lot of questions. How is the chapter organized and where are the meetings? What are the volunteer activities and advanced training? 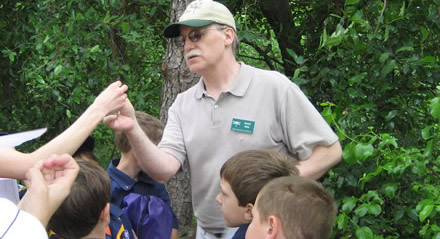 A Texas Master Naturalist is someone who is passionate about the natural world and is eager to share his or her knowlege and experiences with others. It is also someone who volunteers his or her time to the local community by assisting with activities that involve the education, preservation, restoration, and conservation of natural resources. Historically, the Natural Initiatives Program Group, the San Antonio Parks & Recreation Department, and the Texas Parks & Wildlife Department had designed and developed an educational program to improve the understanding and management of natural resources in urban areas. The mission of the program was to train volunteers to work with our community to achieve these goals. From these local origins, the Texas Master Naturalist Program grew into the statewide natural resource-based volunteer training and development program sponsored by the Texas Parks & Wildlife Department and the Texas AgriLife Extension. In addition to our official sponsors, our Alamo Area Master Naturalist Chapter partners locally with the San Antonio Parks & Recreation Department and the Texas Forest Service. As a matter of fact, the Alamo Area Master Naturalist Chapter is the founding chapter in the entire Master Naturalist Program; not just here in Texas, but also nationwide. You must complete the Texas Master Naturalist Program consisting of a 40+ hour training course on regional natural features and on the impact that people have on nature. Also, you must complete a minimum of 40 hours of volunteer service and 8 hours of advanced training during your first 12 months. 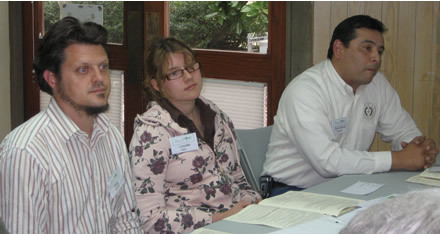 Training courses are held in the spring and the fall of each year and average about 30 students. The course includes presentations by biologists, geologists, naturalists, and others from local, state, and federal agencies and universities. Because the purpose of the course is to train Master Naturalist volunteers, it is available only to participants who plan on completing an official Texas Master Naturalist Program through a recognized chapter. Those volunteers who have some basic knowledge about local natural history are better prepared as Master Naturalists. This course can be a springboard to additional information based on each person’s individual interests. Also, you must complete a minimum of 40 hours of volunteer service and 8 hours of advanced training during the first 12 months following your completion of the course. This must be completed before your class graduation anniversary date. 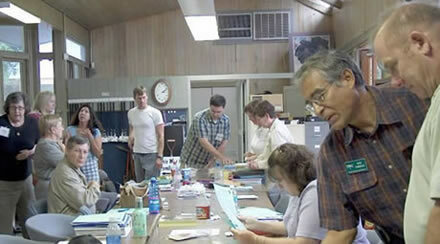 Advanced training enables Texas Master Naturalists to learn additional knowledge or a particular skill in order to assist with different volunteer projects. 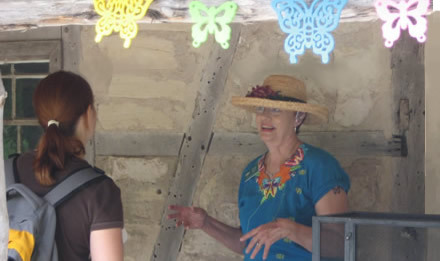 Advanced training activities in the past have involved hands-on instruction, field trips to local natural areas, and lectures with such topics as: Texas bats, Texas insects, Texas aquatic environments, wildscape development, and trail planning, among many others. All of the volunteer and advanced training activities must be approved by the chapter board of directors and you must report your hours to get credit. For those of you who meet these requirements by graduation, you will receive a gold seal for your certificate and will be certified as a Texas Master Naturalist. To maintain certification, an additional minimum of 8 hours of advanced training and at least 40 hours of volunteer service are required each year. As above, all of the volunteer and advanced training activities must be approved by the chapter board of directors and you must report your hours to get credit. Report hours here. The chapter elects the executive board members and the committee chairs are appointed as members of the board of directors. The board members and the committee chairs are listed in the monthly newsletter as well as on the contact page. If you would like to serve on the board of directors or as a committee chair, please refer to the monthly newsletter or the contact page for any openings, or contact the chapter president. There are many ways to get involved, from helping with the big annual events to helping with the monthly tasks. Your help is always needed and is greatly appreciated! 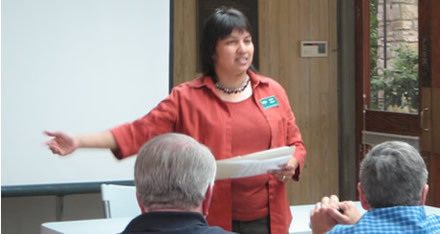 The Alamo Area Chapter meets on the second Tuesday of each month at various local venues, usually at the Bexar County office of the Texas AgriLife Extension Service (Texas Cooperative Extension) located at 3355 Cherry Ridge in Suite 208, San Antonio, TX 78230. 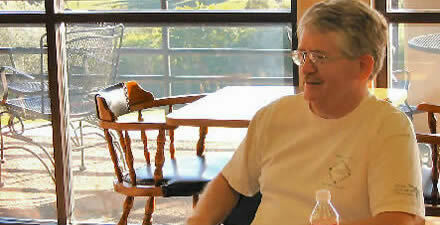 There is usually a guest speaker at the general meeting and often the topic is considered to be advanced training. The general meeting is usually at 7:00 PM. Just before the general meeting, the chapter board meets to conduct chapter business at the same location, usually at 5:15 PM. Refer to the chapter newsletter for any information on the general meeting topics. There are several ways you can keep up with the volunteer activities and advanced training. The two major ways are available online at this Web site, where you can download our chapter newsletter and view our activities calendar. Both the newsletter and this Web site contain chapter news and other related information, and both contain postings for volunteer activities and advanced training. Also, sign-up sheets for various activities are sometimes available at our monthly chapter meetings. If you are a Master Naturalist and have an activity or if you want one approved, find out more here. If you are a sponsor or partner with our Master Naturalist chapter, you will need to fill out the streamlined partner activity approval form and submit it to the activities coordinator for consideration. As above, all approved activities will appear either in our chapter newsletter or on the activities calendar. If the approved activity is ongoing, you will need to resubmit it each year for approval. You can either mail a paper copy of each form or, better yet, email it to the activities coordinator. Each activity must be approved by the chapter board in order for you as a Master Naturalist to receive credit for your volunteer hours, or for you as a partner to request help for your activity from Master Naturalist volunteers. Once approved, the activities coordinator will put the activity on the chapter approved list. Since we are a community service organization sponsored by the Texas Parks & Wildlife Department and the Texas AgriLife Extension, it is important to keep track and report our volunteer hours. This is important not only to maintain our individual Master Naturalist certification, but also for our chapter to tally the total annual hours served. This information is the basis for funding from grants and other programs which help further our goals as Master Naturalists. Log hours here. As long as you desire to keep your membership with our Alamo Area Master Naturalist Chapter, please try to keep us up-to-date with your contact information (especially your home and email addresses). Update information here.